WHAT DID THE MARKET DO? Unfortunately, after several weeks, we can no longer claim that we are dealing with a stable currency. Last week we said that the fact that $BTC was a stable currency was not bad news, and sadly, we were wrong in our prediction, since, as we all know, the $BTC broke down, losing it’s historical support at $6,100. Here we see it clearly, both in the chart on November 15 and in the total figures. The market capitalization has fallen by 13.22% to 185.308 million. Despite the $BTC fall, its dominance has not changed too much compared to last week, currently remains at 52.50%. This gives us the idea that some alt may continue to remain strong despite the disappearance of 28,000 million dollars from the market. The truth is that I expected a higher % shelter in the $BTC. $Dash lost more than 17% capitalization in a week. That is authentic savagery and makes us realize the seriousness of the situation. On 11/11 Masternodes market cap was going up, it seemed an even bullish environment, but the $BTC fall changed everything. 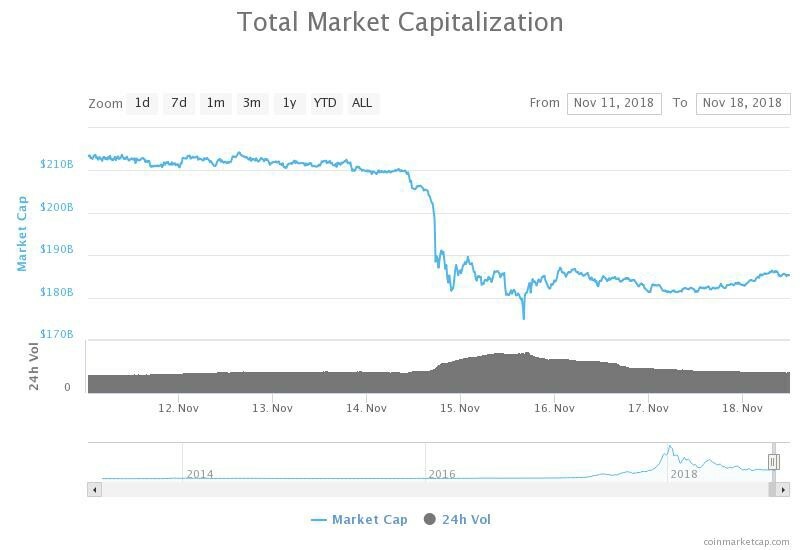 We have lost (if the data is correct) a 41.5% capitalization in 7 days. As you can imagine, it’s a drama. Masternodes Market Capitalization: 1,776 million. $Dash Market Capitalization: 1,130 million. Total Masternodes Market, excluding Dash: 646 million. Total Masternodes Market, excluding Dash on October 30: 1,345 million. This is -52% market capitalization (in $USD) in 18 days. Wow!!!!! About the number of deployed masternodes, we are now at 262,471, it is more than what we had at October 30, 2018: 255,998. But as we said a lot of times, at a much lower growth rate than the rest of the year, so I understand that an average masternode is also much cheaper than before. 2. WHAT DID TRITTIUM DO? 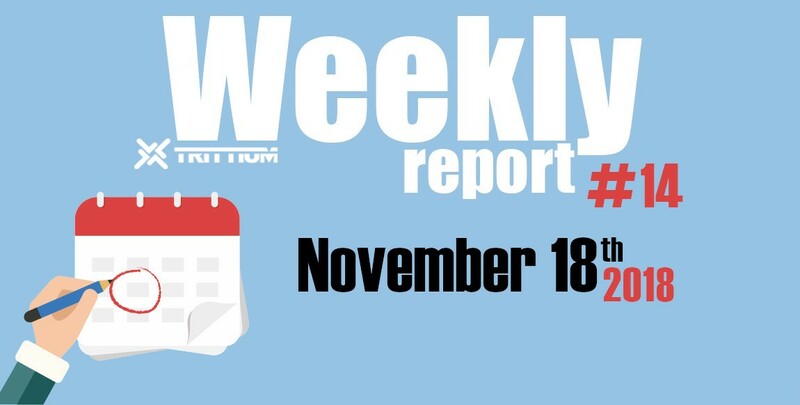 Well as we can see, it has been a lousy week for trittium. We have descended from the 190 sats in which we moved last 11/11 to the current 150 sats. But we must also say that the 150 are holding up well as support, perhaps due to the imminent launch of the trttNode service, which we hope will be launched in public test mode tomorrow, Monday, November 19th. The average trade price is now lower, around 150 sats, and acts as support. The purchase order book is stronger, with 2,47 $BTC in buying orders. The sales orders book has gone up to around 930.000 $Trtt. We now have 33 masternodes in sall orders and 21 masternodes in buying orders, this is a sign of a heavy demand for our project, as releases are near to be real. As you know, in Trittium we are transparent, for the good and for the bad news. When we have bad news to tell, we also do it, without taking into account how that will affect the price in the short term. Our goal is to build in the long term, and we are aware that to do so, we must have community support, no project achieves its objectives without it. And no project achieves anything without encountering stones along the way. But also good news about the trttNode service public test, this Monday!!! One week more, with new deployments, near to launch trttNode service, with a price support at 150 sats and with A LOT of news coming around into the worse possible market situation, but we are here, working hard every day for the Trittium future and for our investments. I am optimistic, the worst has already happened. If you liked the article, please don’t forget to clap!!!! Get inspired by the innovators, share with the dreamers and learn with us. Are you ready?